This WiFi-enabled data logger can remotely monitor an environment over a -20 to +60°C (-4 to +140°­­F) measurement range. Data is uploaded periodically using a standard WiFi network without the need to physically collect and connect the unit to a PC. Data is streamed wirelessly to the EasyLog 21CFR Cloud. The device will store data internally if it loses WiFi connection and automatically uploads it to the Cloud once reconnected. 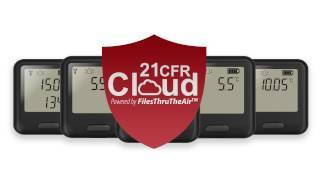 21CFR Cloud subscription delivers all of the flexibility of remote monitoring and can be installed as part of a 21CFR compliant system. Features include permission-based use, authority level sign-off and full system audit to ensure data monitored and collected is regulated to 21CFR Part 11 standard. This device requires a subscription to our EasyLog 21CFR Cloud service. Initial configuration of the data logger is done with Lascar’s 21CFR EL-WIN-WiFi software running on Windows. Download the latest version of the control software or read more about connecting your WiFi device to the Cloud from the link below. What battery life can I expect from my sensor devices?